Open: 9AM to 9PM EST. The Jazzy 1143 Ultra combines sporty style and rugged outdoor performance with a standard power elevating seat that will raise the rider up to 7" higher than standard seat height. This feature is designed to allow the user to raise to most kitchen counter heights as well as to reach higher shelves in stores and in your home. 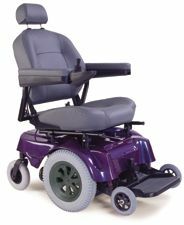 The 12" drive wheels and active track suspension offer enhanced outdoor capability, while its mid-wheel drive manuverability and smaller frame equal a tight turning radius for easy indoor use. All of these features add up to a power wheelchair that is ready for your active lifestyle. 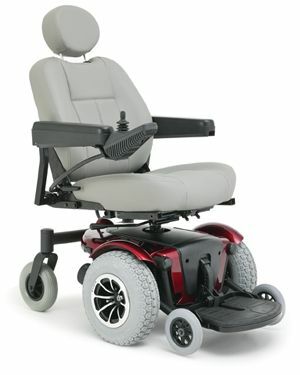 Power elevating Seat is standard! 12" knobby drive wheels and optimum weight distribution offer superior traction. 6" resilient front anti-tips provide greater climbing capability.